A new milestone in Hublot’s history. Hublot hosted a ribbon cutting ceremony with world class Dutch athlete Dafne Schippers to officially open its very first Hublot Boutique in the Netherlands. The store is located at the number one luxury shopping destination of Amsterdam, Pieter Cornelis Hooftstraat. Hublot now boasts one of the finest locations in Amsterdam, surrounded by the most prestigious neighbours in the luxury industry. In true Hublot fashion, the Swiss luxury manufacture celebrated the opening with a special announcement introducing Dafne Schippers as Hublot’s new Friend of the Brand. Dafne Schippers is Hollands most well-known female track and field athlete, born and raised in Utrecht. She shares the brand’s philosophy of appreciating traditions and striving for the best. Dedicating her life to be the fastest woman of all time and become World’s number one. Ricardo Guadalupe, Hublot CEO, Hublot Friend of the Brand Dafne Schippers and official partner Schaap en Citroen represented by Mark Vlijm cut the traditional ribbon to officially open the Brand’s new door in Amsterdam. Other notable attendees include Dutch Football legends Ronald de Boer and Edwin van der Sar, Ajax Football player Siem de Jong, Dutch actor and ‘Friend of the Brand’ Wilfred Genee, popular Dutch artist Joseph Klibansky, Singer Mr.Probz, Dutch former Kickboxer Ernesto Fritz Hoost and Carlito Fuente from Arturo Fuente, partner of Hublot. 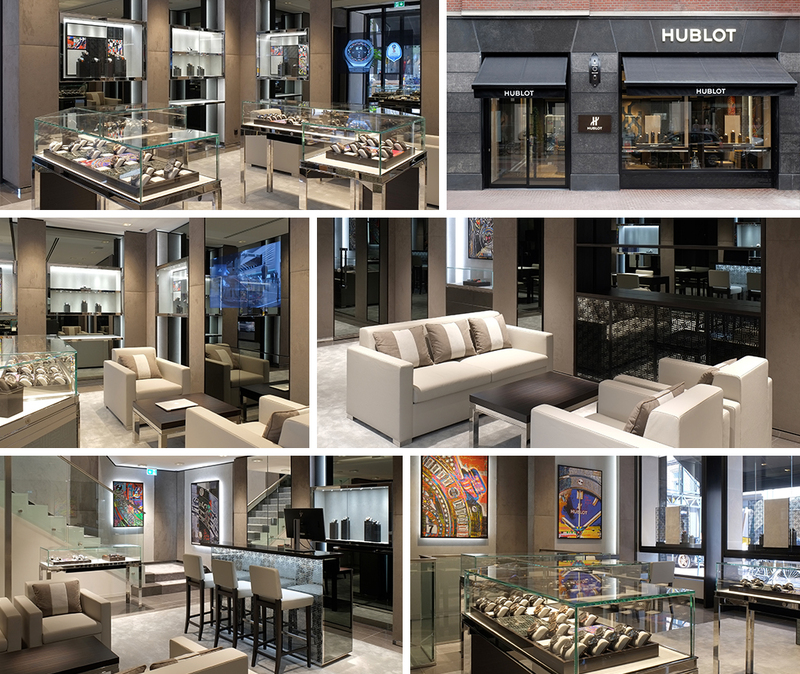 The new Hublot boutique features one-of-a-kind furniture and includes its own VIP lounge and bar. On 113 square meters, the boutique’s design exhibits the brand’s DNA of luxury and innovation combined with its Art of Fusion concept of unexpected combinations. Divided over two floors, the store is outfitted with an all-new concept that is both modern and sophisticated, in which shades of grey and black dominate. It is a cutting-edge design that recalls the Hublot boutique in New York 5th Avenue, designed by the well-known American architect Peter Marino. The store carries a large assortment of rare and limited edition (boutique) pieces.